Heya... Sam here again; relieved to be safe at home on my quiet shelf once more. 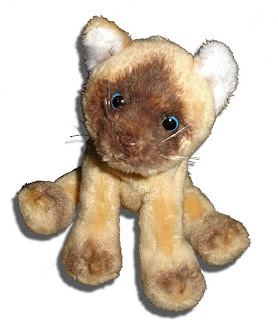 For you see to my great surprise last week, I was suddenly pulled from my warm home and unceremoniously plopped onto a car dashboard. It seems we girls were headed for a "Spring Break Shopping Excursion To the USA". Since floods, snow and my silent protests couldn't stop us, we hit the road early Monday morning to the big city of Minneapolis, Minnesota nearly 800 Km away. I didn't know exactly where that was, but since I wasn't the one driving, I wasn't too worried. Well, not until I found myself in the midst of a scary thick fog, that is. It seemed Mother Nature had more tricks up her sleeve to keep us from invading vacationing in the States. 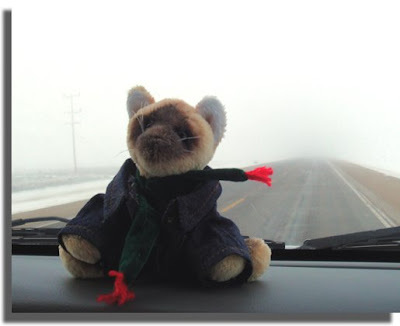 If I could have, I would have covered my big blue eyes with my paws as we sped through the thick soup that at times made visibility barely past the hood of the rented Trailblazer impossible. Don't turn me around; I don't want to watch! After nearly an hour of that heartpounding experience, the sun finally came out as without any warning whatsoever, we arrived at a place called The Border. Apparently this "USA" place is only open from 8 am to 10 pm... is it like a Mall or something? After a few hours we arrived in Albertville... apparently our first "shopping excursion" of the trip. 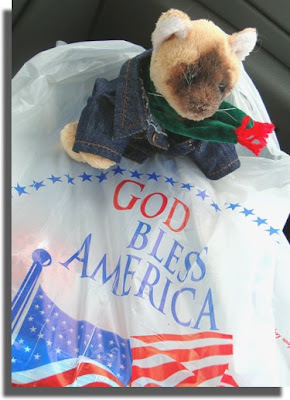 We visited many outlet stores there and since the snow was gone, I could remove my jacket. 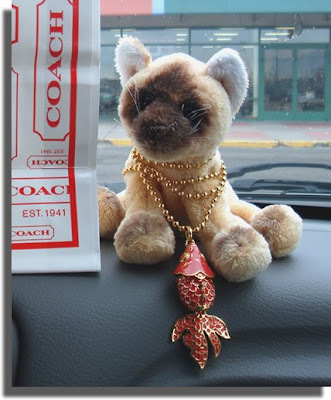 Do you like my new Coach necklace? What? It's NOT mine? Aw crap... okay, the kid can have it. It's too big for me anyways and the fish made my stomach grumble. And Garfield who just wanted to know if we brought any Canadian lasagna with us. All too soon I had to say a quick goodbye, as I was whisked off again for more shopping a few minutes down the highway at Super Target. Good thing we had all day; it was going to take forever to get to this Minneapolis place! Finally as dusk began to fall, we reach our destination. But do we check into our hotel and relax a nice soft, warm bed? More stories and photos upcoming, including The Mall of America, IKEA (again!) , Underwater Adventures and The Trip Back Home. BTW, that shot of the "welcome to the US" sign reminds me of a scene in "Duct Tape Forever: The Red Green Movie", when they arrived in the states. 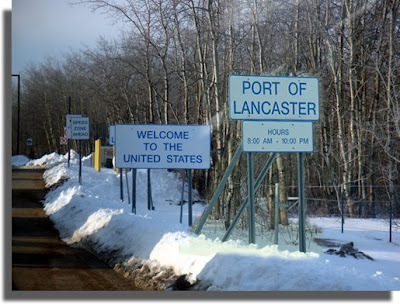 As a matter of record, the reason the Lancaster (MN) border crossing has such reduced hours is largely because of the rural nature of the area. *Middleboro, MB/Warroad, MN (MB 12/MN 313). Oh, Maureen! I love that you took Sam with you! He looked like he had a grand time and did so many things in the States. I'm sure he was ascairt of the fog, but I bet there was a real good driver behind the wheel. Hilarious thing about the times on the sign. How strange. Glad y'all had fun below the border! 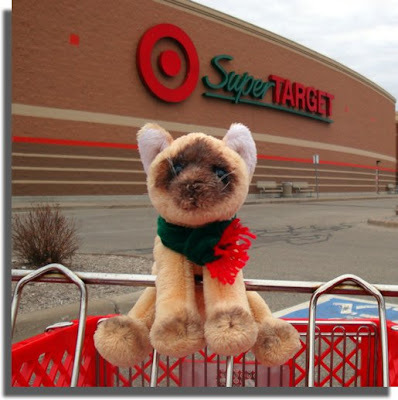 Wow, you got to go to a SuperTarget!! I've never been...now I'm jealous. I see you sampled some of the U.S.'s finest cuisine. ohhhh ihop. i hope you got something slathered in one or several of: fruit, chocolate, whipped cream, or ice cream. i think last time i was there my side options with my breakfast were waffles, french toast or *funnel cakes*?!?!?! omg, carnival food for breakfast? amazing. i can't wait to hear more, that sounds like a super fun trip!! You sure are adventuresome. But all that snow worries me. One time years ago I was hitchhiking from the east coast to the west coast. I got picked up in Oklahoma by some guy who was about three sheets into the wind. Plus, he had a very small convertible. The problem, however, was that the door on the passenger side didn't shut completely, and the the rag top was torn. You know that icy cold gets in through the smallest openings. 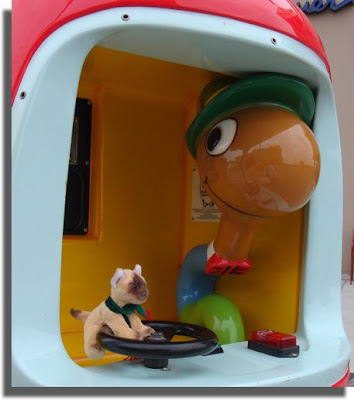 But I needed a ride. So away we went. As we left Oklahoma into Texas we got caught in this huge snow storm. You couldn't see your nose. I swear it was like being on Pluto. We couldn't even see the road markers. It was that deep. And wouldn't you just know it - the engine died. Christ! There we were, stuck, sky all blue, wind blowing like hell. I thought we were going to freeze to death. I've never been so cold in my life. But after about an hour we got it started and managed to turn around and get back to safety. Whew! With due respect to Nanook, I think I'd rather die of heat exhaustion in the bleakest, hottest desert on earth than freeze to death in some out of control snow storm. By the way, my son lives near the twin cities. He loves the place! I love how Sam's facial expressions change in each photo. LOL ... seriously is it me or is that the case? I love the jacket & scarf - very snazzy. JoJo: Luckily Sam is too young to need a passport yet. Daughter, however, will need one starting next month! And yeah, that sign just killed me! The Exaggerator: Yeah, but the Emerson crossing was closed due to floods; that's our usual route, but it was a nice change to go this way for once. Kathy: Oh, yes, we ALL were ascairt there for awhile! I didn't know if it would be better to turn around or keep going; so I kept going! Not a fun way to travel on a two-way highway at 100 Km / hour. Mary: That's the second time we've been to that particular Super Target... so much fun to go back somewhere you know where everything is! Shawn: Oh yes. 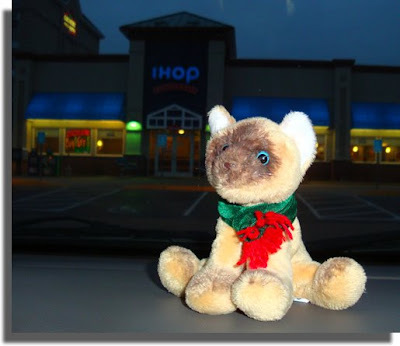 IHOP, Outbacks and TGIFridays... all the ones we don't have up here in the Great White North. Ashley: We went to IHOP THREE times in four days!!! OMG, it was great!!!! More adventures coming, I promise! Heather: :) And more coming too! Oh Swu, what a story!!! That must have been scary. But I am the opposite to you. I prefer the cold... can't stand the heat. So I guess it's a good thing we each live where we do! 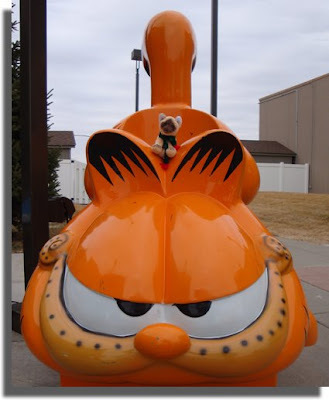 That huge Garfield is awesome, I would love to see that. Looks like a fun trip so far Sam. And I had no idea Coach dabbled in goldfish. VP: Oh, yeah Coach had all kinds of jewellry on display. Daughter fell in love with it on first sight ... "Coach" is lettered in gold around each eye of the fish. And since it was 75% off, it was well within her budget too.